Kibaale District, sometimes spelled as Kibale District, is a district in Western Uganda. Like most other Ugandan districts, it is named after its chief town, Kibaale, where the district headquarters are located. Kibaale District is part of the Kingdom of Bunyoro, one of the ancient traditional monarchies in Uganda. The kingdom is coterminus with Bunyoro sub-region, home to an estimated 800,000 inhabitants in 2002, according to the national population and household census, held that year. The five districts in Bunyoro sub-region are: Bulisa District, Hoima District, Kibaale District, Kiryandongo District and Masindi District. 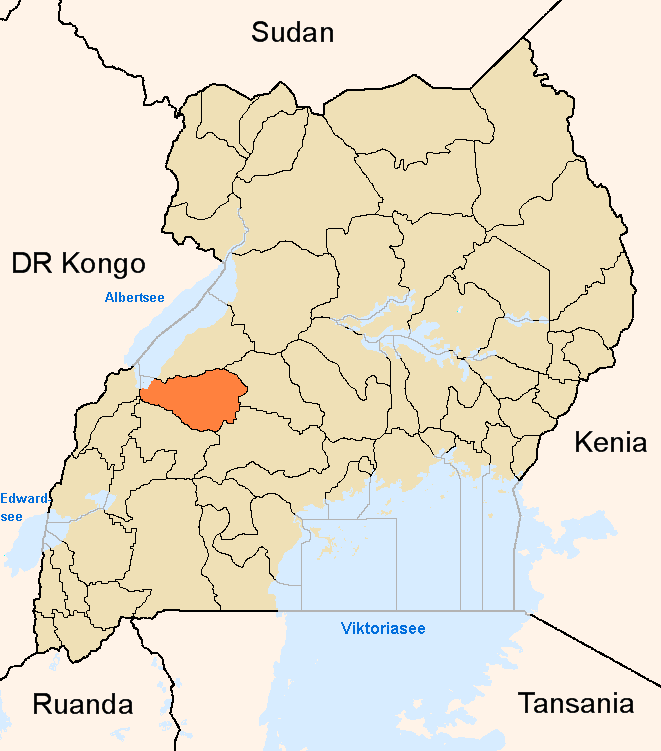 Kibaale District is part of an area known as “Lost Counties”. In 1900, the 1900 Uganda Agreement defined the boundaries of Buganda Kingdom, including the important areas of Bunyoro south and east of the Kafu River. The area soon became known as the “Lost Counties”. The counties were included as a sub-national territorial element of Buganda. The administration of the “Lost Counties” as well as Bunyoro itself was modelled on the Buganda political system and under the leadership of Baganda chiefs. In addition to land the Baganda held political and administrative positions from village chief and upwards. The Baganda also controlled schools and churches in the “Lost Counties”, and Luganda was the only native language allowed in public institutions. Buganda was at the center of the colony while Bunyoro remained as a subsidiary territory. After a referendum in 1964 the counties of Buyaga and Bugangaizi, which constitute present-day Kibaale District, went to Bunyoro Kingdom, and subsequently political and administrative control shifted from Baganda to Banyoro hands. President Obote abolished the kingdoms in 1967, but the counties remained part of Bunyoro District. In 1974 Bunyoro was divided into North Bunyoro and South Bunyoro, which were renamed Masindi District and Hoima District, respectively, in 1980. In 1991 Buyaga and Bugangaizi separated from Hoima District and became Kibaale District.